The Institute for Supply Management's survey of manufacturing companies continues to show relatively robust strength. The current level of the index strongly suggests that GDP growth will continue to improve this year from last year's 3% level. Upward price pressures continue, unfortunately. This is fully consistent with the CEO of Walmart's warning yesterday that consumers could see some significant inflation at the retail level this year as higher commodity and input prices are passed along. 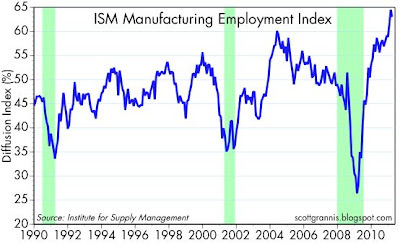 Employment conditions remain very healthy. 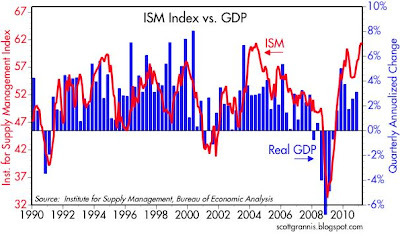 Overall, today's ISM report was strong. There's a lot of underlying strength in the economy that is underappreciated by those who continue to focus on all the things that are still wrong with the economy (e.g., the still-high level of unemployment, the ongoing weakness in housing, the dreadful state of the federal budget and unfunded liabilities, the rather tepid recovery to date, and the rise in oil prices). In my view, what's wrong is well known and it's very old news; it's priced into the market and it's impact has been mostly absorbed by market prices. What's more important is the change on the margin (e.g., improving manufacturing conditions, a pickup in the pace of hiring, a new mood in Congress that will almost certainly result in slower spending growth and at least some positive tax reform), and that is very positive. 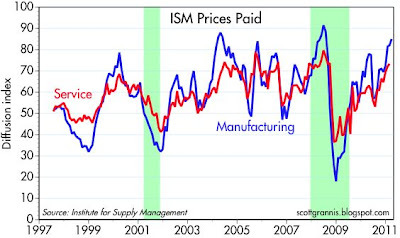 The trade-enhancing level of the US dollar is pushing up manufacturing. Inflation? Mr. Wal-Mart is too politic to notice his unit-labor costs have been going down, not up. The CPI today is almost unchanged from August...of 2008! Wal-Mart is a private-sector company, and I expect they will show the innovation and flexibility (though they are getting too big) to change with the seasons. Other retailers will too. So will consumers. It is our bloviating federal government, with its huge rural welfare apparatus, its archipelago of military-foreign policy missions and its extensive and outdated social welfare mission that needs to change.